If you have a feeling of fatigue or lethargy for no reasons and many more symptoms like skin dryness, puffy face, constipation, muscle weakness like tenderness or stiffness in muscles, inflammation in joints, elevated levels of blood cholesterol, wheeziness, irregular menstrual cycle, thinning of hairs, depression and memory impairment and weight gain. Where as in the case of children and adults symptoms associated with hyptothyroidism are improper growth, mental illness and delaying in puberty and delaying in the development of permanent teeth. So if you have these symptoms do visit your doctor because you can be the sufferer of hypothyroidism. In a survey it has been found that female are more prone to hypothyroidism as compare to men. Thyroid glands – triiodothyronine (T3) and thyroxine (T4) helps to maintain the body's usage for fats and carbohydrates, control the body temperature, affects the heart beat and productions of proteins. Hypothyroidism develops when thyroid glands enables to produce the enough hormones. AUTOIMMUNE DISEASE – Autoimmune disorders develop when your immune system produce the antibodies that start attacking own tissues. So these antibodies also affect the thyroid’s functioning to produce hormones. HYPERTHYROIDISM TREATMENT – Radioactive iodine or anti thyroid medications are used for the treatment of hyperthyroidism to reduce the thyroid hormones and normal functioning of thyroid gland. Due to this in some cases hypothyroidism is developed. IODINE DEFECIENCY – Iodine is the trace mineral, found in the plant which are grown in iodine rich soil and also found in seafood or seaweed. Iodine is mandatory for the thyroid hormone production. But in some countries where iodine is added to table salt may increase the autoimmune thyroid diseases. THYROID SURGERY – Removal of portion of thyroid gland can terminate the hormone production. In this case, you are needed to take the thyroid hormone throughout life. RADIATION THERAPY – Radiation therapy is done in the treatment of head and neck cancer which also leads to hypothyroidism. MEDICATIONS – There are some medicines which also lead to hypothyroidism like lithium which is used to treat the psychiatric disorders. CONGENITAL DISEASE – Some babies are born with the impaired thyroid glands. So, it is mandatory that newborn’s thyroid screening should be done. PITUITARY DISORDERS – In few cases hypothyroidism may be develop due to the failure of pituitary glands which are responsible for the production of thyroid stimulating hormones. PREGNANCY – Hypothyroidism may be developed during pregnancy, because antibodies are produced to their own thyroid gland. Untreated hypothyroidism may lead to miscarriage and premature delivery. There is condition known as preeclampsia occurs which is related to increase blood pressure during the last three months of pregnancy. Don't take this disease lightly because it may lead to numerous health problems like goiter, heart complications, mental health issues, infertility, stress and birth effects. In Ayurveda there is no proper description of hypothyroidism. But a disease galgannda is described in Ayurveda which is associated with the neck swelling according to atharva veda. But hypothyroidism is a not a localized disease but it includes the various parts of body. Planet Ayurveda offers an herbal product named as the gotukola capsules for the treatment of hypothyroidism. These capsules are prepared from the pure extract of herbs Gotu kola (Centella asiatica). These capsules are 100% pure and free from any side effects. This herb has great medicinal importance because it provides the relief in the symptoms associated with the hypothyroidism like fatigue, lethargy and mental stress. Gotu kola is quite effective to improve the thyroid functions in order to release the thyroid stimulating hormones. DOSAGE – 2 capsules, two times in a day after meals with plain water. Chanderprabhavati is the amazing blend of 23 natural ingredients like Shilajit (Ashphatum), guggul (comniphera mukul), Sharkara (sugar), Karpoor (Cinnamomum camphora), Vacha (Acorus calamus), mustak (Cyprus rotundus), Hridra (Curcuma longa), Amalaki (amla) (Emblica officinalis), Chavya (Piper chaba), Vidanga (Embelia ribes), Giloy (Tinospora cordifolia), Shunthi (Zingiber officinalis), Maricha (Piper nigrum), Pippali (Piper longum), Sarjikashaar (Sodium carbonate), Yavkshaar (potassium carbonate), Saindhav lavan (Rock salt), Suvarchal lavan (sodium sulphate), Vida lavan (Black salt), Dantu (Baliospermum montanum), Dalchini (Cinnamomum zeylanicum), Tejpatta (Cinnamomum tamala) and Ela (Elettaria cardamomum). This herbal product is quite effective to provide the relief in the symptoms associated with hypothyroidism like fatigue, skin dryness, inflammation in joints, and tenderness or stiffness in muscles. Herbal remedy for hypothyroidism by Planet Ayurveda offers the guggulipid capsules which are 100% pure. These capsules are the combination of various natural ingredients like Guggul resin (Comniphera mukul), (Dalchini (Cinnamomum zeylanicum), Maricha (Piper nigrum), Pippali (Piper longum), and Sonth (Zingiber officinale) and Bhumi amla (Phyllanthus niruri). Guggul capsules are quite effective for the treatment of hypothyroidism. They help in production of thyroid hormones. 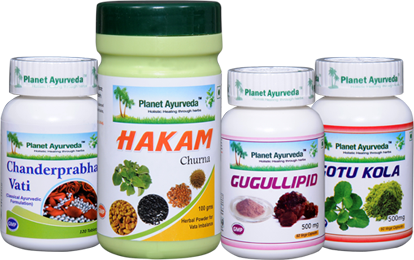 Hakam churna cosists various ingredients like Chandershoor (Lepidium sativum), Kalonji (Nigella sativa) Methi (Trigonells foenum graecum) and Ajwain (Trachyspermum ammi). Herbal remedy for hypothyroidism is quite effective and shows the satisfactory results in the sufferer. This herbal product is totally safe for use without any side effects. It helps to proved relief in the symptoms associated with hypothyroidism like weakness, skin dryness, memory impairment, inflammation in joints and weak muscles. It maintains the function of triiodothyronine (T3) and thyroxine (T4) glands. Thus it favors the production of thyroid hormones. DOSAGE – 1teaspoonful, two times in a day. If you have hypothyroidism then you need blood tests after specific period of time or as directed by your doctor. With the help of blood tests you may come to know the elevated or decreaed levels of thyroid hormones. "We become what we eat. So take a healthy diet if you want to save yourself from health complications." Take antioxidant rich fruits and vegetables because they provide the benefit to thyroid glands. Include probiotic rich food in your diet like kefir which is a fermented dairy product which is a good supplement in the problem of hypothyroidism. Drink clean water which helps to provide the relief in the symptoms associated with hypothyroidism like skin dryness, fatigue and constipation. It has been proven that small meals are healthy for the persons who are suffering from hypothyroidism as compare to eating large meals every day. Taking 5-6 small frequent meals helps in the weight loss and gets rid from the symptoms of this disease.